Summer science camp continues with a simple at home science lab that I set up one afternoon to keep my 5 year old busy. 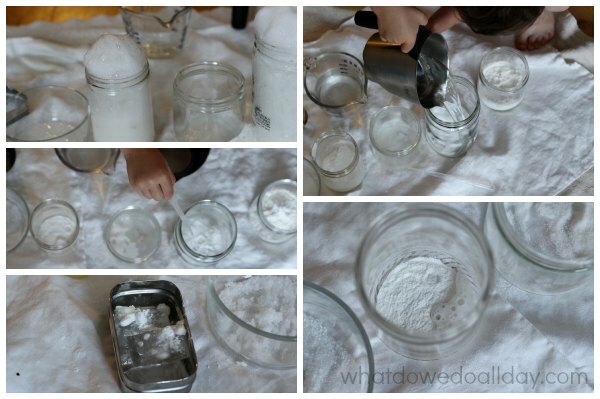 This idea is perfect for preschoolers and kindergarteners but even older kids will love to explore the chemistry of mixing different household items they find in the kitchen. The idea behind this lab is to let kids have a little free play with mixing up concoctions. Let them say “Whoa!” and encourage their curiosity instead of prescribing a set of instructions they have to follow. Bonus: there’s no way to fail. 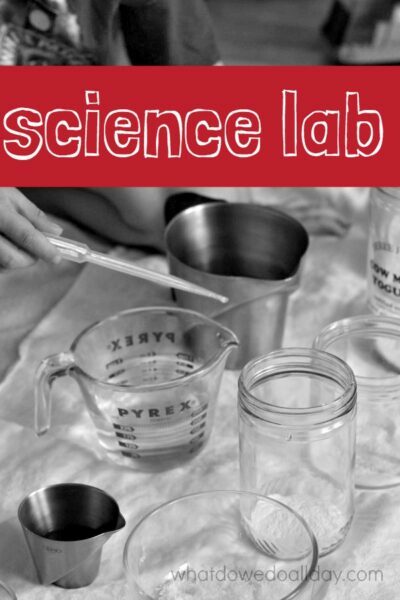 A science mixing station can easily be adapted for older kids who may want to keep a chart of their findings and compare and contrast exact measurements. Dry kitchen ingredients. We used: baking soda, baking powder, salt, sugar, and corn starch. Liquid kitchen ingredients. 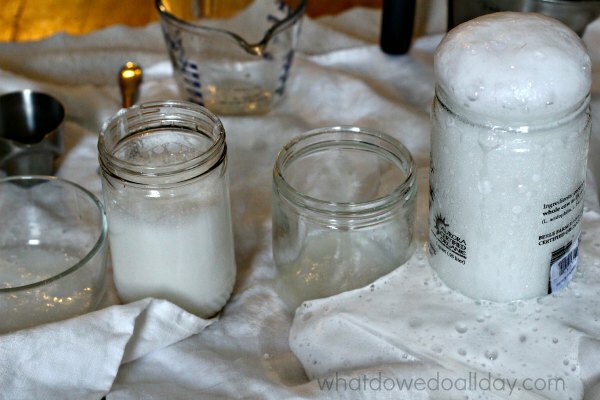 We used white vinegar, water, and lemon juice. We also included ice. You can set this up inside or outside. If you work inside, I highly recommend placing the items on several thicknesses of towels so clean up is easy. Don’t be afraid of mess! 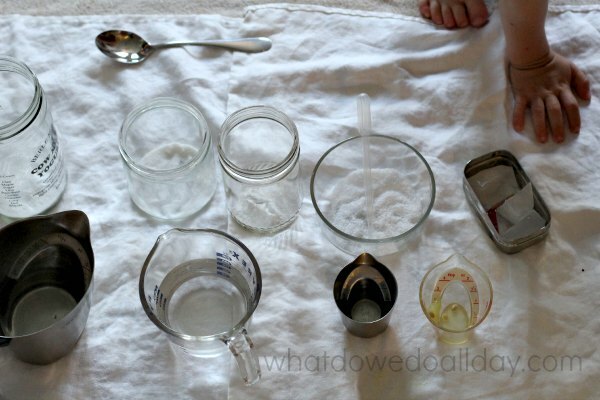 Place dry items in separate jars and fill measuring cups with liquids. How you proceed from here is up to you and the age of your child. I did chat a bit with New Kid on the first go around of mixing. I named each item and we poured a little bit of water in each one to see what happened. Then we repeated this with vinegar, and so forth. After than, my son decided how he would mix each substance depending on how it reacted. More: Want to add color changing? Try this simple acid and base science lab experiment. 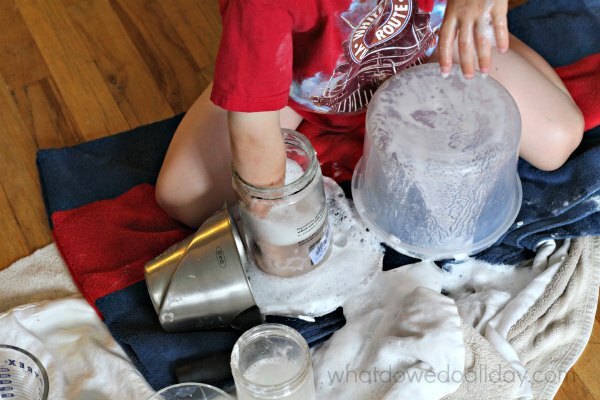 Since I know my 5 year old is into all things bubbly, I had an entire box of baking soda and a jug of vinegar at the ready to keep him mixing and happy for a while. Click here to see our exploding car wash science play activity for another fun way to use soda and vinegar. He also loved pouring the cups into one another. Don’t forget to head over to Coffee Cups and Crayons to see what Megan and her kids are mixing up this week! Have you ever set up a mixing station with your kids? 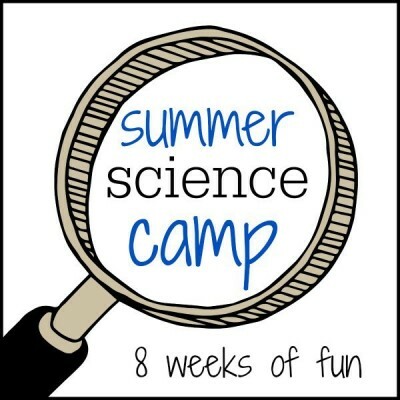 See all our DIY Science Camp ideas! Follow Erica • What Do We Do All Day?’s board Science Activities for Kids on Pinterest. What science projects are you doing this summer? This looks fun! A couple times we made a volcano with vinegar and backing soda. I think we used up all the vinegar doing it over and over. I am planning on featuring this activity at the #lovetolearnlinky too. Thanks again for sharing. Sometimes all you need is things around the house to make learning fun! Great ideas! Free exploration is so important in developing science skills and a love of science. Thanks for inspiring curiosity!